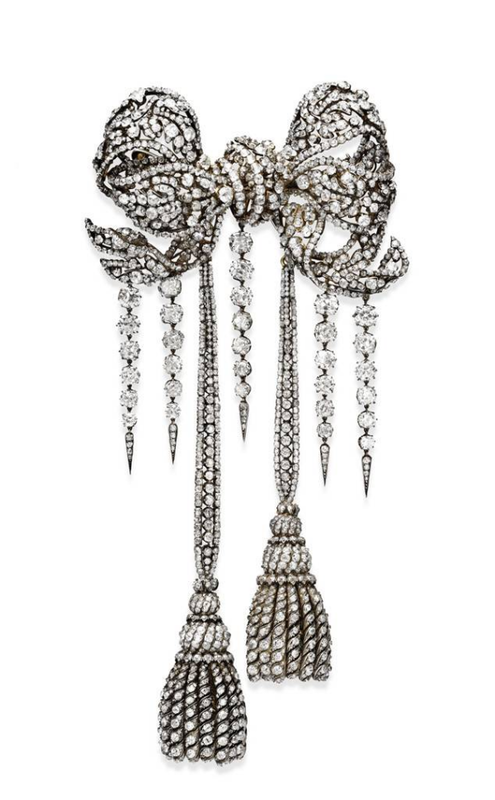 Our journey through the remarkable jewelry collection of our Magpie of the Month, Empress Eugenie of France, arrives today at a truly stunning piece of art: her massive Diamond Bow Brooch. Once worn in France's royal palaces, the bow took a meandering path, eventually returning to one of France's most cherished institutions. But Eugenie was very much in the "more is more" camp where jewelry was concerned, and she asked Kramer to transform the bow brooch into a larger stomacher ornament. 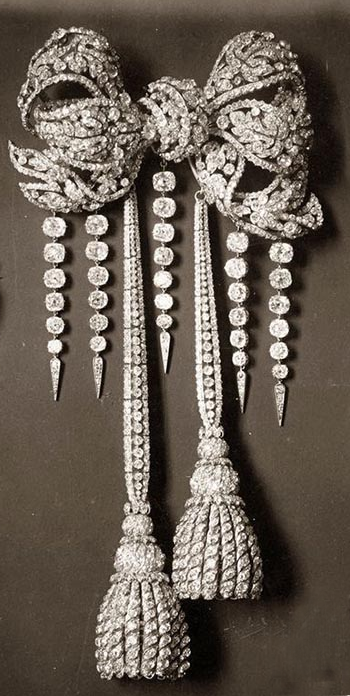 The resulting devant de corsage featured five pampilles (or fringes), as well as two elaborate diamond tassels. The jewel was one of many pieces left behind when Napoleon and Eugenie went into exile in 1871, and it was also one of the pieces that the French government decided to sell at auction in 1887. The image above is from the catalogue that accompanied that sale. At the auction, the ornament was purchased for 42,000 francs by a French jeweler, Emile Schlesinger -- but not for himself. 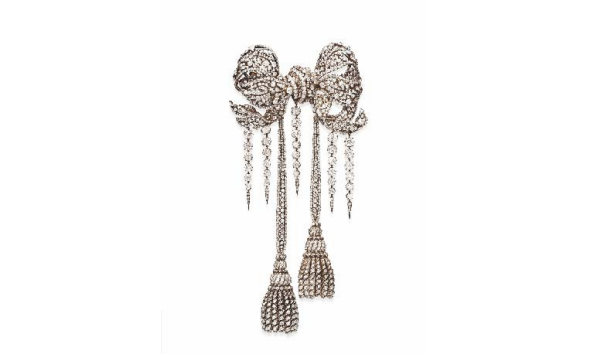 The client for whom Schlesinger acquired the bow brooch was none other than The Mrs. Astor. 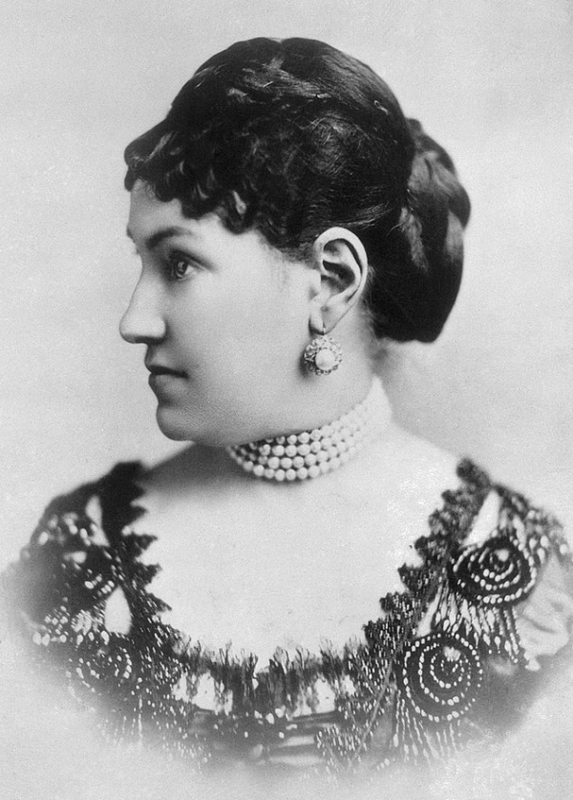 Caroline Schermerhorn Astor was the doyenne of New York society, gatekeeper of the Gilded Age splendor of the city. She added the bow brooch to her already extensive jewelry collection, and it stayed with the family for a century, becoming known as "Mrs. Astor's Diamond Stomacher." In April 2008, just before the recession, the brooch popped up on the public market, offered for sale at Christie's in New York in connection with another jeweler, Ralph O. Esmerian. Aware of the link between the brooch and Empress Eugenie, an organization called the Friends of the Louvre planned to purchase the piece. But a legal battle involving Esmerian ultimately led to the cancellation of the sale. 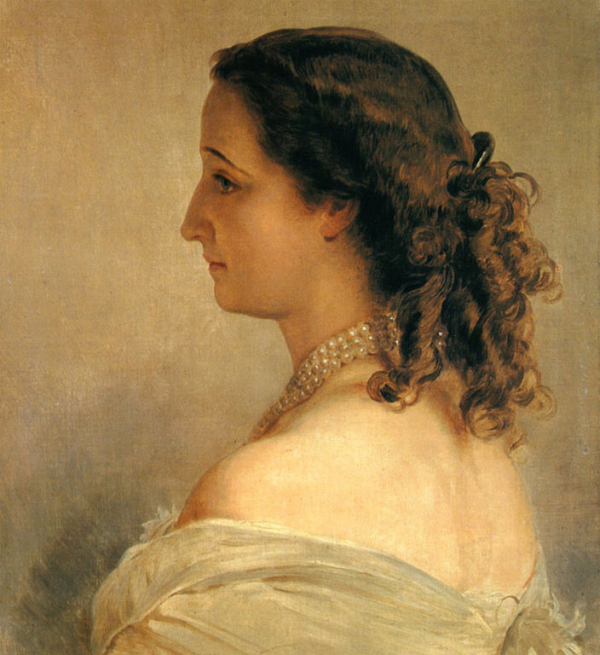 Nevertheless, the Friends of the Louvre were intent on acquiring the brooch for the museum, which already holds several other pieces of Eugenie's jewelry, including her grand pearl and diamond tiara. François Curiel, President of Christie’s Europe, helped to coordinate a private sale, and the Friends of the Louvre were successful in purchasing the brooch after all. Henri Loyrette, then director of the Louvre, noted, "Among the great missions of the Louvre is the development of the museum’s collections, with a particular focus on works of art and precious objects belonging to members of the former French Royal family. The crown jewels are important among the nation’s treasures and we are thrilled to see the brooch of Empress Eugenie returning to France." Hugh Roberts noted the similarities between the Dorset brooch and Eugenie's Bow Brooch in his 2012 book, The Queen's Diamonds, and yep -- when they're seen side-by-side, the similarities are far too close to be coincidental. 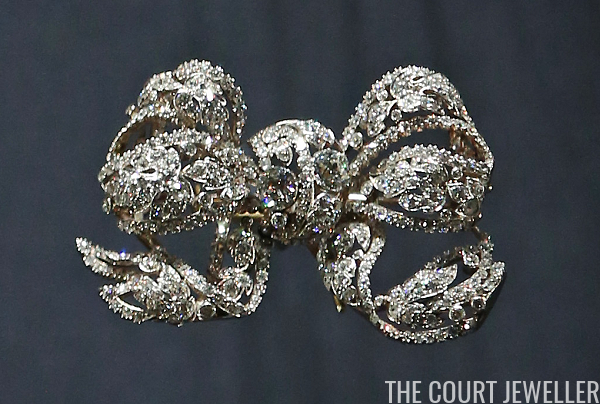 Seems like perhaps Carrington took some very literal inspiration from Eugenie's brooch when making this royal treasure?